Jean and Lois have just autographed 15 copies of this book for a book fair that got cancelled. If you would like to order one of these, we'll sell them for $10 plus shipping -- either $1.42 media mail, or $3.85 priority mail. You can order up to 3 copies without increasing the postage. We can accept PayPal, checks and money orders. NESSIE AND THE LIVING STONE. A boy must choose between keeping a treasure and saving a monster in Nessie and the Living Stone, by Lois June Wickstrom and Jean Lorrah, http://www.lochness-monster.com. Craig's family, including his bratty little sister Linda, are on holiday at Loch Ness where Craig has plans to capture Nessie, the famed Loch Ness Monster. Instead, she captures him. Wickstrom and Lorrah have written a clear, compelling story of a child’s moral choices, and learning to care about the world around him. The authors deftly handle the siblings’ growing affection and developing independence as the story’s events demand their strengths. When Craig faces his ultimate test at the door of Nessie’s grotto the reader feels the difficulty of Craig’s choice. As the story opens, Craig’s goals are fame and fortune. He finds a fascinating blue stone that leads him to Nessie’s grotto. There he finds everything he could want: a treasure chest of Viking gold and a magnificent stone carved by Merlin himself. Even Nessie does his bidding. It’s all there for the taking. But the price would be Nessie’s life. Nessie’s and her children’s. Linda’s fondness for flowers adds humor and pathos to this affectionate tale. The mysterious landlady at the bed and breakfast provides hints in the form of chores. And a local fisherman seems to know where they are going before they know themselves. So does the bossy coast guard officer who wants to kill Nessie and stuff her and put her in a museum. On one level this is an adventure story with a satisfying ending. It’s also a tale of a maturing sibling relationship and a growing awareness of the world. Mostly, it’s a story about Nessie. As the landlady says, "Most of the folk around here think that we need Nessie—to give this place a bit of mystery. Truth is she needs us—to keep her house in order." Wordweaving, Christine Spindler, Simply Ebooks, Barryon, and more! Click here to listen to Jean Lorrah read from Nessie and the Living Stone. Click Here for MP3. 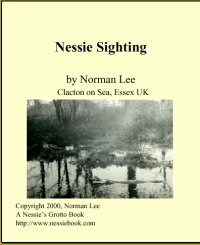 Get a free copy of Norman Lee's account of his 1970 Nessie Sighting. This rare detailed account is charming and convincing. The download URL will be in your first message from Nessie's Grotto. Join our Grotto mailing list! Want to join the ~eBooks Plus Web Ring~?